There are some wonderful man made creations in the world. They are genius works of engineers, designers, architects and artists. You have got to see them to believe them. 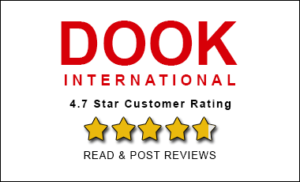 You might have read or heard or seen wonderful works of engineers in the world. They created some truly amazing bridges. And in this article we will touch one of those bridges. You would have seen bridges which are opened and drawn. There is one such bridge in St. Petersburg, Russia. This is Palace Bridge. You might already know about this. 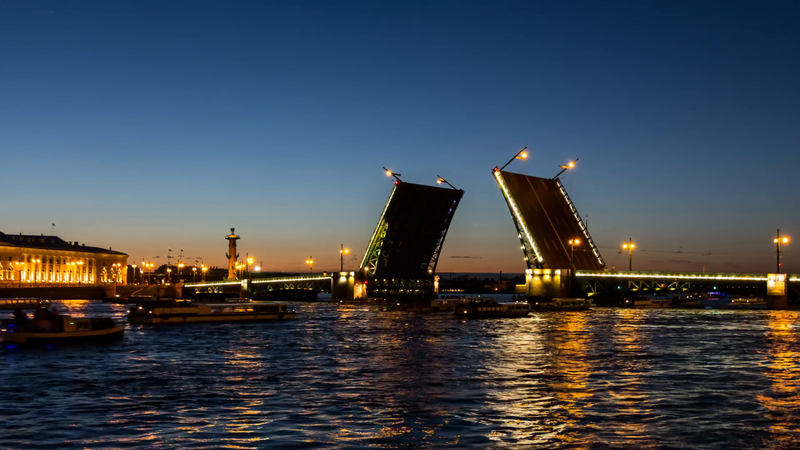 But if you don’t then you are recommended to see this bridge when you go to St. Petersburg with St. Petersburg Tour Packages. 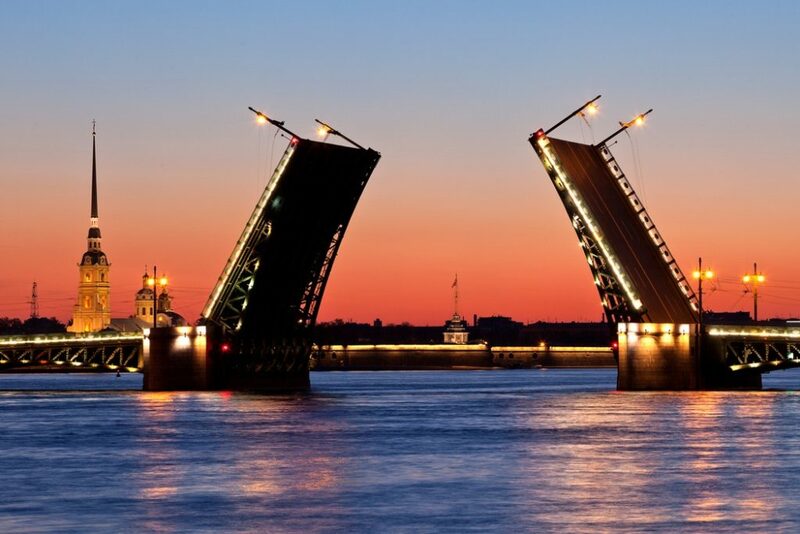 The bridge was created in 20th century and it is one of the most famous sights in St. Petersburg for the visitors. Let us explore this bridge further. 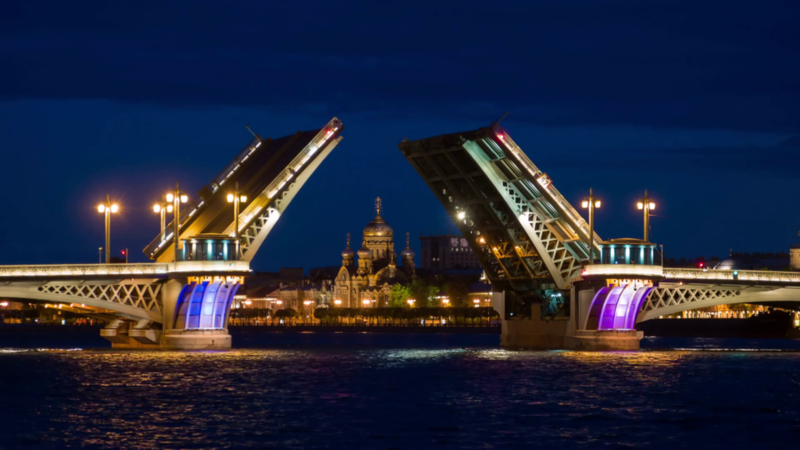 Palace Bridge is a road and foot traffic bascule bridge on Neva River. A bascule bridge is a movable bridge. Palace Bridge spans the Neva River between Palace Square and Vasilievsky Island. The bridge is located on the axis of palace lane and stock exchange square. Like other bridges on Neva River, Palace Bridge is also drawn by night. So, movement by foot between various parts of St. Petersburg is almost impossible through Palace Bridge at night. The bridge was built in 4 years between 1912 and 1916. The bridge’e total length is around 260 meters and the width is around 28 meters. The drawing mechanism of of the bridge consists of the engine which opens up 700 ton of each bridge flights. The engine consists of motors, huge gears (some of these gears are are still the original ones) and thousand-ton counterweights. The bridge has a long history as the completion of the bridge went through different phases. The bridge has been restored several times and most recently it took place in 1997. Those who come to St. Petersburg must take a walk on Palace Bridge to move between Palace Square and the Hermitage Museum. And at night simply the view of bridge is awesome. The bridge also takes you to the numerous historic attractions on Vasilevskiy Ostrov. The height of the bridge was kept to a certain limit keeping in mind the fact that it should in no way restrict the viewing of monuments around. The bridge has 5 spans. The central span of the Palace Bridge splits into two wings. These two wings are raised in such a way that it allows ships to pass up the Neva River. Between the two wings one gets the view of the golden spire of the Peter and Paul Cathedral. Also the nightly celebrations during the White Nights take place here. Many of locals and visitor gather here to watch Palace Bridge open in the small hours. This is bridge which carries weight of over 30000 cars every day and sees some of the heaviest traffic in St. Petersburg as well. Though Palace Bridge is frequently used by visitors to reach the Hermitage Museum yet it is an interesting place for them in itself. Palace Bridge is a great place for viewing some great monuments around. These monuments which you can see from the bridge include the Winter Palace, the Peter and Paul Fortress, and the rows of palatial buildings along both banks of the Neva. This simply means you get to see some of the most impressive places of the city. But the bridge is not just a location for viewing monuments and scenery around, in fact the crossing of the bridge has been designed in such a way that it would not detract from the surrounding sights. 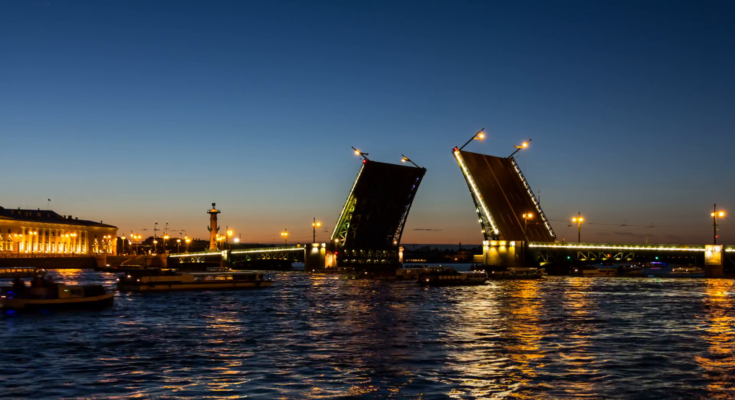 When you are here on your St. Petersburg Holiday Package, you should make your way to Palace Bridge, especially when the raising of the bridge takes place. This makes the bridge a major attraction in St. Petersburg, Russia.